CAMBRIDGE - Patricia Yeo is explaining how she has prepared four traditional Chinese New Year’s dishes in just over half an hour. “Most of the time it takes to make Chinese dishes is spent chopping the meat and vegetables,’’ says the executive chef of Om Restaurant in Harvard Square. Given the complexity of the food, and her unhurried demeanor, the timing seems impossible. But here they are: stir-fried Chinese kale with roasted garlic and oyster sauce, dan dan noodles, pork and Tianjin cabbage pot stickers, and a whole steamed black bass. The flavors of Yeo’s dishes pop as intensely as the pans they sizzle in. The Year of the Dragon began on Monday, and to many, the water dragon is a lucky year for anything new, from babies to businesses. The 15-day Chinese New Year celebration is layered with ceremony and tradition. Red envelopes with even-numbered amounts of money (avoiding the number four, which sounds like the word for “death’’) are given to children and the elderly, and each day has different and sometimes odd proscriptions. Through it all, dishes that are full of flavor and significance abound. There are many variations on the holiday. Many of Yeo’s recipes come from home and are dishes she refined. She was born in Oregon to ethnic Chiuchow (Southern Chinese) Malaysian parents, grew up in England and Malaysia, and trained as a chef in San Francisco under a legend, the late Barbara Tropp at China Moon Cafe. Her take on the foods and traditions of Chinese New Year draws on all of these experiences. The chef is in the final stages of opening Moksa, a 200-seat pan-Asian small-plates restaurant in Central Square, with an on-site nightclub called Naga (the name of the dragon-like monster seen thrashing about in Chinese New Year’s parades). The project, financed by Om owner Solmon Chowdhury, aims to be one of Cambridge’s largest eateries, where you can dine most nights until 2 a.m. on the full menu. So it shouldn’t come as a surprise that Yeo is fast at the stove, and with her large blackened steel wok, even speedier. “The wok is designed to be efficient with what was a rather limited amount of fuel way back in the day. No long simmers here. The heat is concentrated, right at the bottom.’’ Yeo is small and slight with dark oblong glasses. She has a vaguely British accent, and an easy, modest, calm confidence. Yeo’s dumplings, as is the custom, are made in shapes that resemble ancient gold and silver ingots, to summon wealth in the coming year. Noodles served during the holiday weeks, she says, signify long life. As such, neither cook nor diner should cut them. This includes the unwieldy curly ramen noodles Yeo serves today. Her Chinese kale (kai lan) is a holiday dish in Malaysia. For it, she makes her own oyster sauce from reduced local clam broth. The two most popular centerpieces on the celebration table, fish or chicken, are cooked with the head and tail intact, to symbolize wholeness and a favorable beginning and end to the year. Yeo feels optimistic about the new year (4092 on the Chinese calendar). For many, the year of the water dragon is believed to be the most fortuitous for new ventures, and for the economy in general. The year’s elements (water, earth, fire, metal, and wood) rotate every two years; the year’s animals rotate every 12. The last time water and dragon aligned was in 1952, when there was an unprecedented boom in the world economy. That year the United States, which then had just 7 percent of the world’s population, was able to produce 64 percent of the world’s manufactured goods. The water dragon is considered so lucky that China’s carefully planned births are expected to rise this year, as parents try for water dragon children. At her new venture - Moksa is Sanskrit for “destiny’’ - Yeo will be making Asian street food and protecting “the integrity of the dishes’’ from modern ingredient substitutions, she says. That means diners will experience funky flavors like shrimp paste and fermented fish, authentic levels of spice, traditional herbs and sauces, Sichuan peppercorns, and, she says, “no cornstarch, ever.’’ She has hired an expert in feng shui (the Chinese science of orienting objects for auspicious function) to consult on arranging the layout of the club and restaurant. “There’s this silly thing called the Year of the Water Dragon - but I’ll take it,’’ says the chef with a laugh. She’ll celebrate, taking care never to cut her noodles and keeping other traditions in line. 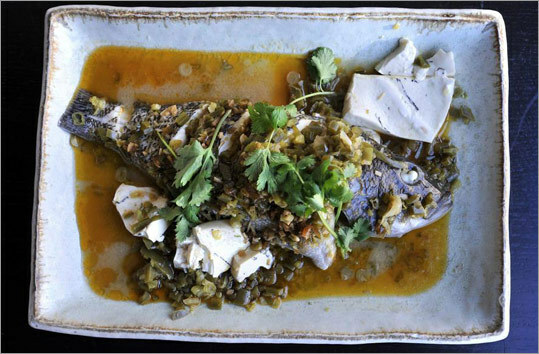 In an uncertain market, Moksa has a promising location, menu, and concept. With a little help from the lucky dragon, it could be a very good year. Patricia Yeo says that round Shanghai dumpling wrappers are easiest to use. Her favorite brand is Twin Marquis. They are flexible and the edges seal easily. You can fry or steam dumplings or drop them into hot soup to cook. They also have a nice chewy bite, and what Yeo describes as "a pleasant, slippery mouthfeel." Place 1 teaspoon of the filling in the center of a wrapper. With your fingers, wet the edge of the round with warm tap water. Fold the wrapper in half. Press the curved edges together with a thumb and index finger. Starting at one end of the wrapper, pleat the edges with your fingers to seal in the filling. Work your way around the wrapper until it is sealed. Continue filling and pleating dumplings. Fry the dumplings briefly in canola oil, on one side only, until they are golden brown and crisp. Serve with a dark vinegar-ginger dipping sauce.